It is one of the most hotly contested and closely watched areas of research - how to provide the most efficient energy source for the mobile devices we carry with us. Batteries and fuel cells are established contenders to power laptops and mobile phones, but now researchers at the Massachusetts Institute of Technology (MIT) have come up with a novel approach to the power conundrum - by building an engine on a chip. 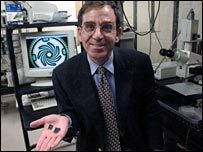 Gas-turbine engines more normally power whole cities but MIT's Professor Alan Epstein was determined that minuscule versions could be used to "power a person". "A laptop that will run for three hours on battery charge will run for 15 to 20 hours using the microengine and it should end up costing no more than current batteries," said Professor Epstein. It has been a long road for Professor Epstein and his team of 50 other staff and students. "When I first told people that I wanted to build a gas-turbine the size of a 50p piece they fell off their chairs laughing," he told the BBC News website. But with the experts needed to make his vision a reality just a stone's throw from his office at MIT, it didn't take long to persuade them that he wasn't joking. "A few days later they would call back with a way to do things and then they were hooked," he said. So how exactly does one set about making a tiny fuel-burning engine? A compressor, a combustion chamber and a spinning turbine are all essential parts but obviously cannot be made in the conventional way on such a tiny scale. So the team had to use etched silicon. The resulting microengine is made up of six silicon wafers piled on top of each other and bonded together. 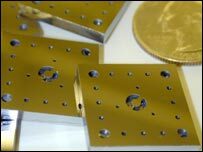 To bring down costs, up to 100 components are made on one large wafer and cut into individual units. The process begins with a tiny combustion chamber where fuel and air mix and burn at the melting point of steel. Turbine blades spin at 20,000 revolutions per second. A mini-generator produces 10 watts of power and a tiny compressor raises the pressure of air in preparation for combustion. The cooling process is managed by sending the compression air around the outside of the combustor. Separately it has been proved that all the parts work so the challenge now is to test an integrated chip. According to Professor Epstein, this should be done by the end of this year but it won't be easy. Each microengine will be on a single piece of silicon so there is no margin for error. One tiny mistake in a single component would mean starting from scratch, and if anything needs to be changed, the whole design process would be back to the drawing board. The journey so far has been "an astonishing amount of fun", said Professor Epstein, although, as with many projects, threw up surprising problems. "What we thought was going to be hard, wasn't, and the things we hadn't thought about were the biggest problems," he told the BBC News website. "We thought the combustor would be one of the hardest things but in fact it turned out to be the manufacturing of the bearings that was more difficult," he said. While Professor Epstein has lived and breathed his project for the last 10 years, he is aware that there is plenty of competition around. Batteries are improving all the time, while announcements about advances in fuel-cell technology are regular and closer to commercial reality. What technique wins out will ultimately be down to what consumers find most satisfactory. "The users don't care about what powers their laptop. Whether it is chemistry or thermodynamics is a mere detail," he said. The idea of engine-powered laptops may seem outlandish but research is ongoing to put other types of engine on chips, according to Professor Epstein. As well as millimetre-scale combustion engines, there is also the possibility of laptops powered by steam engine - which would perhaps be the ultimate collision between old and new technologies.